You want to save time and money, so you take your child to the emergency room for a dental problem. It’s a growing trend especially among parents, but you should generally avoid using the emergency room when dental problems occur. We understand you want your child to receive the best available care in the quickest manner possible. However, it is important to know the best place to seek out for dental issues is often our office. 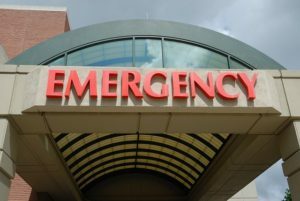 Over the past several years there has been a noticeable increase in the number of patients admitted to the emergency room because of a dental issue. The American Dental Association estimates that emergency room visits for dental issues occur roughly every 15 seconds, for a total of 2.2 million patients per year. If your child has a broken jaw or severe bleeding from the mouth, then an emergency room visit is in order. However, when it comes to severe discomfort from a toothache, broken teeth, or extensive decay, our dental office is a much better option to help treat you. Our office is equipped with a knowledgeable team that specializes in dental care. Our dentist also uses special tools that an emergency room would not be equipped with. When it comes to children, many parents take their kids to the emergency room because of insurance. You might think it will be easier and cheaper but the reality is often the opposite. Those lacking dental insurance seek out the hospital as a cheaper alternative, only instead to be billed excessively for what is likely considered a “non-emergency.” Also, emergency room wait times can often be extensive so it is usually not a quick alternative. Our office works hard to ensure visitors receive excellent, affordable care in the quickest manner possible. Talk to us about your own situation so that we can reach a solution. A visit to the emergency room is costly. Instead, your best defense in keeping a healthy mouth is by setting up regular visits to our office. Many who seek dental care in the emergency room do so because they neglected to act sooner, but our professional dental team can assist you. Tackling dental care early is your best defense. When it comes to receiving dental care, our office has the knowledge and experience to best serve you. Our dentist has the necessary tools to treat patients. We strive to see our patients in a timely manner, so call our office to schedule your next visit. If you have any questions about keeping your smile healthy, please contact our office. 60016 Dentist | What is Orthognathic Surgery?